Netgear R7000 was considered to be a long-awaited rival in the AC1900 series competing with a lot of other top-notch expensive routers like Asus RT-AC68U and Linksys EA6900. Netgear Nighthawk AC1900, a newly offered router from Netgear also commonly known as Netgear R7000 is so far one of the best brought into the market. It is perfectly made for the home users. The device is perfect for the people who are looking forward to developing or create a state-of-the-art network system at their house. It has 2.4GHz and 5Ghz transmitters giving speed upto 1.9 GBPS. It comes with the detachable antennas and wall mount option. 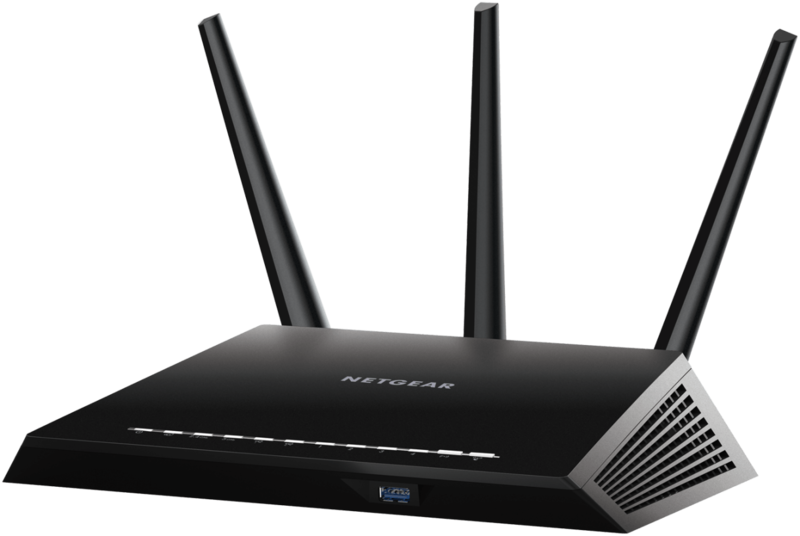 Netgear Nighthawk R7000 is a bit larger than its predecessor model the R6300 which has released a year ago. 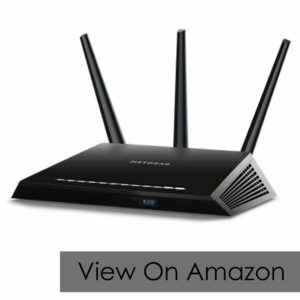 R6300, at that time, appear to be a game-changer in Wi-Fi routers due to it’s unique design. R6300’s design was with that flat surface allowed it to stay flat instead of standing vertically. The problem with RC6300 was its heavy weight due to its three detachable external antennas which are resolved now in R7000. The router now comes with wall mount deducting a significant amount of unnecessary weight. Nighthawk router is caged in a plastic-made chassis which is strong, sturdy and durable. Also, the skin of the material doesn’t react to fingerprints, so it is dirt-proof as well. Netgear R7000 appears as a compact version of the brand’s well-known model R8000. It is 11.2 x 7.3 x 2.0 inches structured and angled with three ‘fin’ like attached antennas. They are formed according to utilize the beam-forming technology so to further optimize the signals for better performance. The antennas are highly functional to aim at the signals and grab the strongest ones. These antennas are detachable or can be unscrewed to use it with some third-party product as well. The design is one of the strongest attributes of the R7000. This is because it allows you to either make it flat sit on a shelf or luxury to put it on the wall with a wall mount. Not to mention, the highly-programmed antenna structure, customized to aim better and perform accordingly. At the front, the device has a lot of LEDs implying the status for different functionalities going around the Wi-Fi connection. These LED lights are indicating only when it is turned on and actively connected to the internet along with activity in its two bands. There are lights which shows that whether the Ethernet ports are active or not. Then, there are other status indicative LED lights for WPS (Wi-Fi Protected Setup) and Wi-Fi transmissions as well. Like its expensive successor R8000, It doesn’t have any physical switches to make the lights off or on. However, this can be done from the system’s software very easily. The device might not have any physical buttons to control the lights but it does have switches to control the power, activating WPS or deactivating Wi-Fi transmissions. You also get a reset button to re-program the Wi-Fi router’s firmware setting and start fresh. When you see the back of your Wi-Fi Router R7000, you will find four gigabit Ethernet ports. However, you won’t find the group of high-speed ports that usually found in great Wi-Fi Router products. There is a USB 2.0 port in the back and USB 3.0 port in the front to use the hard drives, printers and memory drives. Netgear R7000 uses 3×3 dual-band approaches instead of tri-band design with 2.4 and 5 GHz transmitters. Theoretically, R7000 reaches upto the bandwidth of 1.9 GBPS. Just recently, Netgear has brought the 4×4 model update in this product which goes at the peak at 2.3 GBPS but surely comes with an extra investment in that. The overall design of Netgear R7000 Nighthawk is geeky yet classic, especially what it has done to the built-quality and option of wall-mount. It doesn’t stand but instead, it sits on the surface. There is the easy addition of the fast 3.0 USB port in the front making the accessibility of ports easy. The design is more apt and sensible than any of the Netgear models before. Unlike its predecessor, clearly, it is more solid, compact, light-weight and high-performance and comes along plastic chassis and wall-mount. Unlike its successor, it is not much expensive and more practical to be in cost-efficient or say home application. As per the features of Netgear Nighthawk AC1900, it is also not something you get disappointed. The features of Nighthawk R7000 are undoubtedly perfect, especially for the price range it comes with. Like RT-AC68U and EA6900, Netgear escalated to get the Broadcom BCM4708A chipset in the router. The chipset is widely popular for the high- performance boost in router devices. The chipset brings ‘Turbo QAM’ which is a proprietary technology offering the boost of 802.11 n 2.4 GHz speed from 450 MBPS to 600 MBPS. The R7000 comes with Beamforming, a technology which enables the device to find and recognise the connected devices and boost the signals in a particular direction rather than spreading out equally to all direction. It increases the strength of the signals along with the performance of the router conclusively. Additionally, you are also getting the feature of WPA/WPA2 security along with WPS, VPN and guest network support as well. Even there you get a customized free of cost URL if you are looking to setup your own personal FTP server. In one line, it is fastest, rangiest and most efficient wireless router to buy in the market. Like its earlier models, R7000 is quite easy to setup which is one of the most significant qualities of this router. Netgear R7000 comes with a network cable, AC adapter and helping booklet. You won’t get any CD or software and it is required to download it from online website. The wireless router comes along with the printed name and password on the label at the bottom for 2.4 GHz band. For 5 GHz band, the name of the network will be seen as 2.5 GHz network name plus 5G as suffix where same name and password will work. These networks will be visible for the people looking for a Wi-Fi connection. With this information, you can simply plug the router to the Internet using a network cable and you will be all set to start. Suppose you lose this label with name and password after setting up everything. The first time you start a browser, it will take you to the page of the Netgear Genie Web Interface. And soon you can access the same information on the screen to note down or print it out. If you want to customize the router more, you need to go to that web interface and customize your connected device. For default login, use ‘Admin’ as username and ‘Password’ as Password. Or you after plugging the Router to the internet source, you need to type your IP address in the search bar or routerlogin.net after which you will see the Genie Software from Netgear. Apart from that, you can also manually configure the router R7000. You will also get unique names and passcode underneath the router which is suppose to be changed quickly. The Netgear router works with anything in between WEP to WPA2. R7000 comes with highly intuitive and interactive interface software which has applications for PCs, Macs, Androids and iOS devices. Not just that, the interface itself which can be tap by pointing at the web browser window at the home address of the router. The primary screen of the Genie Software’s interface has a great overview to inspect about your internet connection, detect any errors or for parental controls. There are plenty of option and features to customize your internet through the controlling the router. It also reflects the various status of the router functionality like whether the internet is working or not, whether USB is connected or not and other similar functions. R7000 hasn’t stopped there with great customization features as the device can list and map all the clients what the traffic is coming or going. You have a traffic meter to monitor how much traffic is there at your network and from where it is coming or utilizing. It is the very easy installation of an online monitoring system for the internet whether it is a small workstation or a house. It is also a quality of service kind of feature where you can choose or prioritize particular to the client to have particular data packets. R7000 has everything which you get in the predecessor R6300 but as per hardware, it is impressive in the case of R7000. This model is an authentic dual-band router that supports all the Wi-Fi clients present in the market irrespective of their Wi-Fi standards. It offers upto 1.3 GPPS Wi-Fi speeds on 5GHz band working with 802.11ac clients. However, it is something that R6300 also offers. But apparently, R7000 offers upto 600MPBS of wireless speed on 2.5 GHz instead of the earlier 450MPBS. That is also because Netgear Nighthawk AC1900 router is the second one after ASUS RT-AC68U that is using new BROADCOM BCM4709 Wi-Fi Chip with the proprietary technology of TurboQAM. Due to this chip, 200 MBPS can be delivered instead of 150 MBPS by each 2.4 GHz spatial stream. The BROADCOM BCM4709 Wi-Fi chip is giving more benefits to 2.4 GHz Wi-Fi than the newer 5 GHz Wi-Fi but for that wireless clients should be TurboQAM compatible. The hardware is really something to admire with Netgear R7000 as it comes with high-end hardware components. Such impressive hardware components include dual-core CPU running at 1,000 MHz, storage space of 128 MB, 256 MB of DDR RAM along with 3.0 USB port at the front of the device. The Netgear Nighthawk AC1900 is powered by 1 GHz processor along with 256 MB DDR RAM and 128 MB storage space. The Netgear R7000 is able to work with three different and independent lanes of data flow or connection streams. As it has the dual-band, theoretically it gives around 1.9 GBPS of bandwidth. According to some significant tests, the transmissions with this router are always unobstructed and efficient. The device is also able to move upto 444.8 MBPS of bandwidth in the 5 feet area. It is a great result especially comparing the price with the top-notch Wi-Fi routers in the market. There are a lot of significant brands and pricey models which Nighthawk proudly outperforms. Conclusively, Netgear Nighthawk AC1900 is rangiest, efficient and fastest wireless router perfect for home applications. It does have limitations as compared to other pricey competitors but it is still a price-for value deal with a range of features it offers. So you should go with Netgear Nighthawk AC1900 router if you want to spend less and get a good Wi-Fi router. Undoubtedly, Netgear Nighthawk or Netgear R7000 is one of the most desirable options for the people who demand a lightening-speed but practical and easy-to-setup Wi-Fi connection in a reasonable price. Surely, there are some constraints with the Nighthawk or some one or two drawbacks in very less concerned areas but it is negligible under the light of the affordable price. The performance it gives with 256 MB RAM and 128 MB storage build with impressive hardware components optimizing the highest speed of 1.9 GBPS. The build material of the product is solid, sturdy and highly durable, not to mention dust free. R7000 also got rid of the heavyweight it predecessor use to carry, so now it may not so much light-weight but it is lot less than earlier. Plus having the option of detachable antennas and wall-mount, it is very easy to place it. There are multiple LED lights for the status of ongoing functions in router ranging from internet connectivity, USB connectivity and more. Genie Software is a plus point feature in its catalog as it gives you a great option to customize. You get to customize your router and monitor the traffic system and sources as well. The device might lack few points but overall it is almost close to be the best Wi-Fi router in the market. Till then, it won’t be wrong to say, it is the one of the best Wi-Fi router that you can buy.